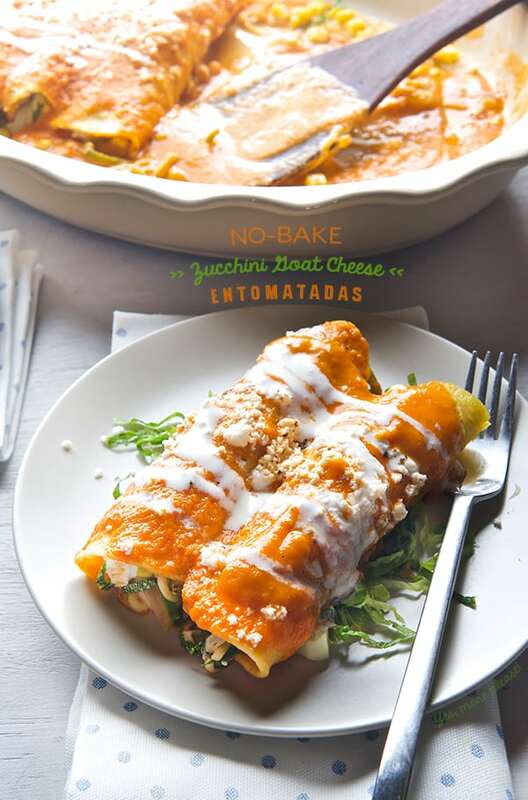 Zucchini Goat Cheese Entomatadas ~ Yes, more please! 2 sprigs of fresh epazote, if you can’t find epazote you can use a mix of fresh tarragon and mint, or just mint. Extra Virgin Olive Oil for sautéing and drizzle the tortillas. 2 sprigs epazote or mint. 3 tablespoons of plain Greek yogurt+ 2 tablespoons water + salt + pepper, shake well on a drizzle bottle or whisk on a small bowl. 1. Make the sauce. With a paring knife make a little cross on the bottom of each tomato. In a medium sauce pot place tomatoes and Serrano chiles, bring to a simmer cover with a lid for a bout 10 minutes, or until tomatoes are cooked. Once they are cooked, carefully remove skins and the bellybuttons. Using a blender or immersion blender puree the tomatoes, Serrano and herbs. In a sauté pan drizzle some extra virgin olive oil and saute the onion and garlic for 1-2 minutes until translucent. Add the blended tomato sauce, salt, pepper, cumin, and the chicken stock. Stir well and bring to simmer for about 15 minutes. Remove any foam that it might form. 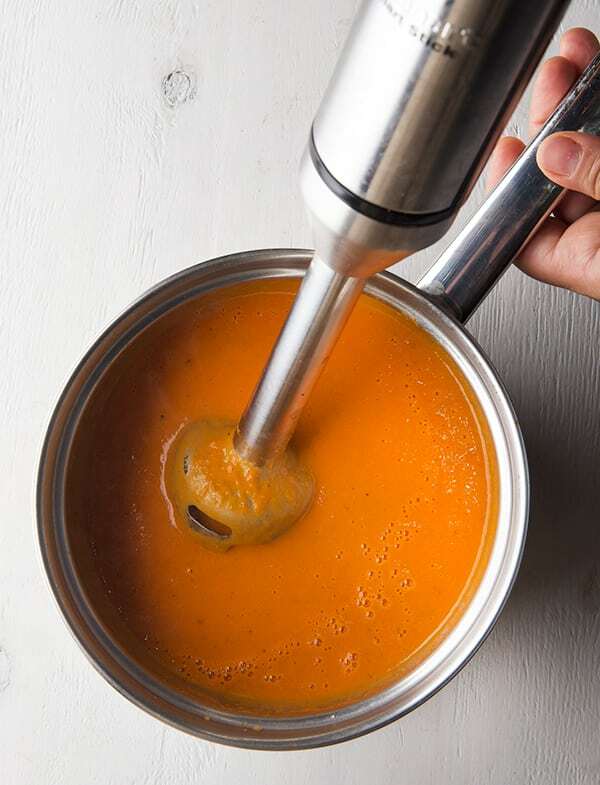 Using an immersion blender puree the sauce in the pot, or place it on a blender to puree. This will produce the most velvety tomato sauce with out adding any cream or milk. Once blended, place the sauce in the same pot and keep it under slow simmer to keep reducing it. Taste and adjust for salt if needed. Sauce should be velvety and the consistency should cover the back of a spoon. See picture below. 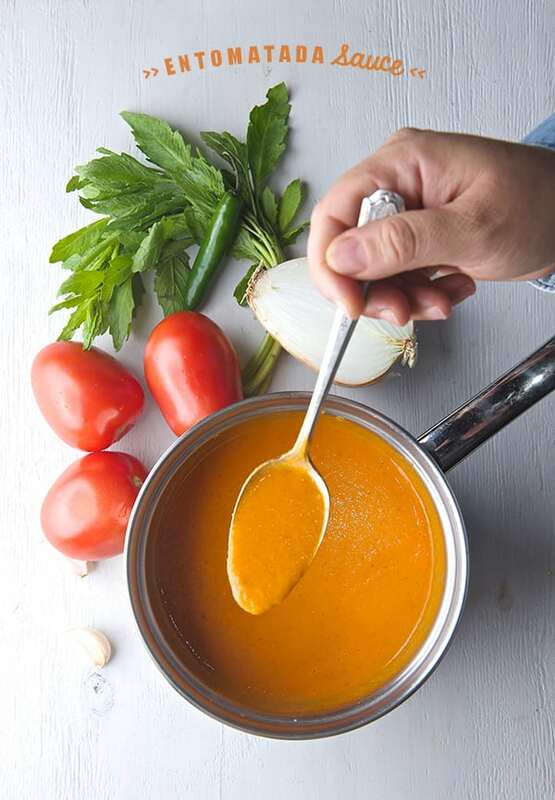 If your sauce is to runny keep simmering until reaches the right consistency. 2. 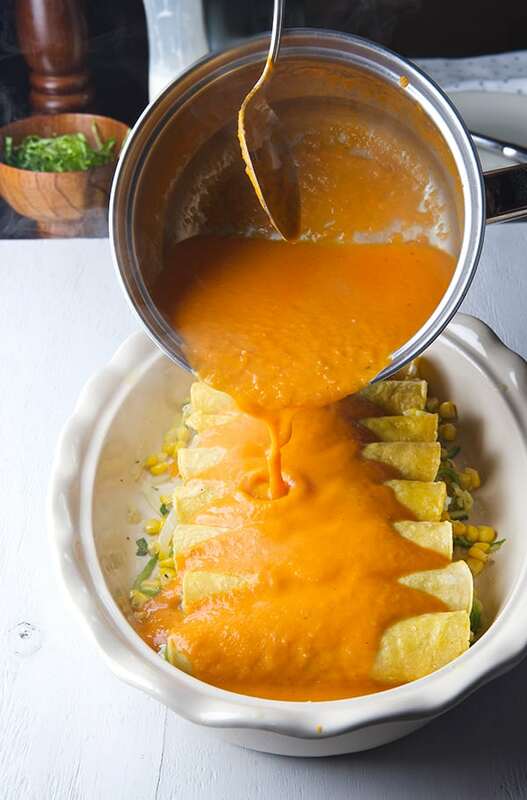 While the sauce is simmering, make the filling. 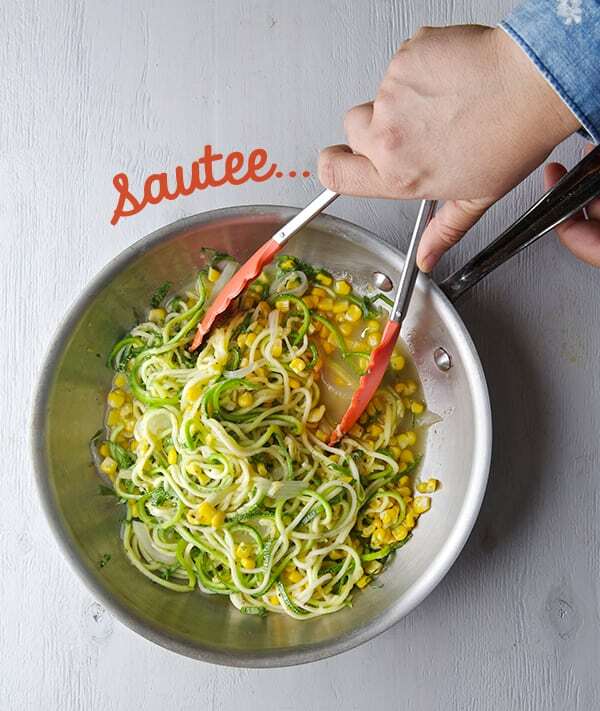 In a sauté pan drizzle some extra virgin olive oil, add onions, garlic and corn kernels, sauté for 2-3 minutes, add the zucchini, herbs, salt and pepper toss well. Cook for a quick 1-2 minutes, being careful not to over cook the zucchini. Remove from heat, set a side. 3. Now we are ready to assemble! 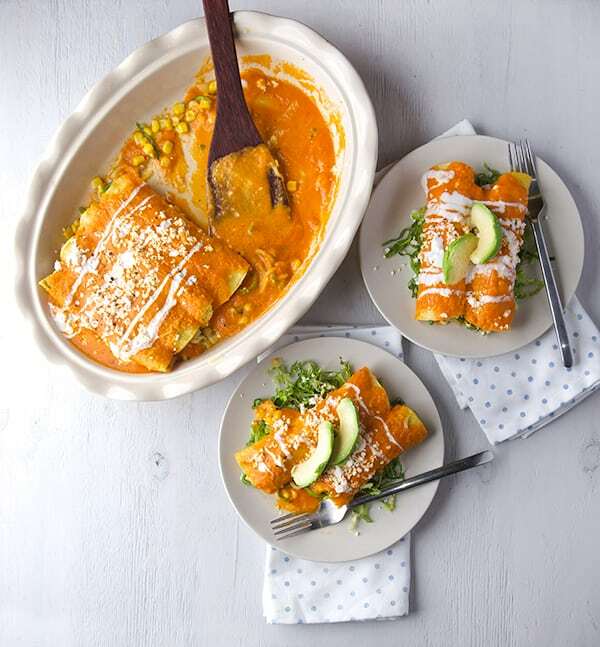 Warm your tortillas, and on a ceramic dish or plater drizzle a little extra virgin olive oil place one tortilla and kind of smoother it with the olive oil. 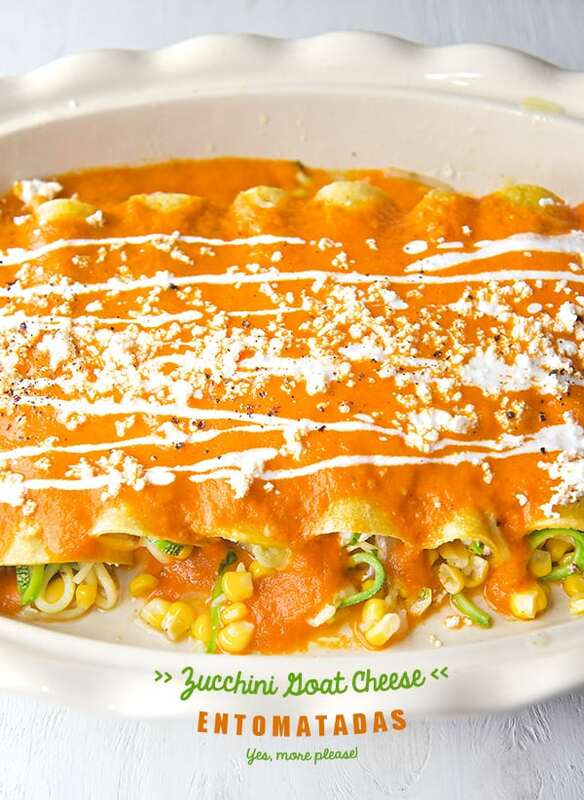 Add a generous amount of the Zucchini filling, crumbled goat cheese and roll them up! 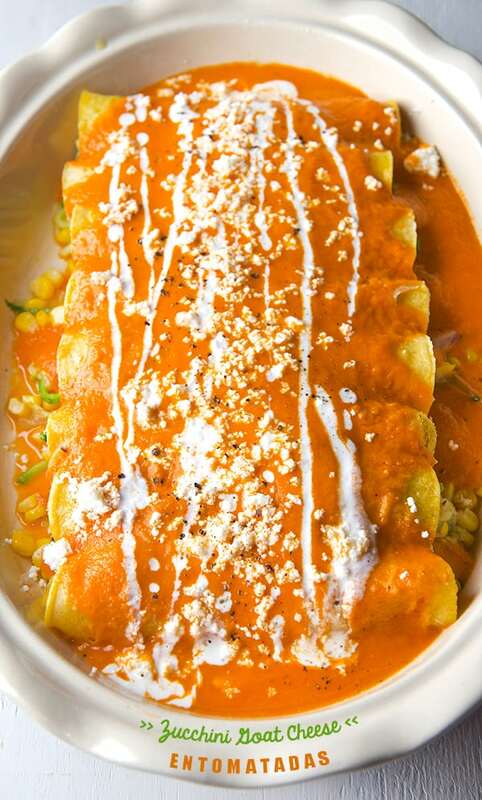 proceed with the rest of the tortillas. 4. 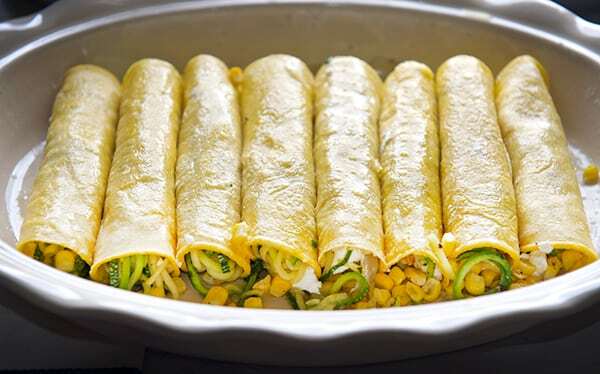 Once you have them all rolled up, proceed and poor all the piping hot tomato sauce on top. Drizzle some crema or greek yogurt mixture, queso fresco a bit of salt and fresh cracked pepper. Dinner is ready to serve!!! 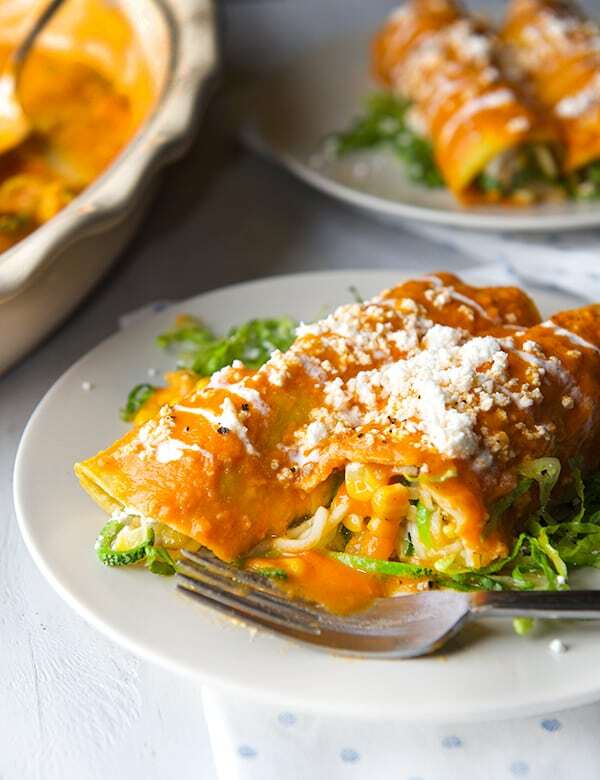 Serve this entomatadas on a bed of finely chopped lettuce, avocado and if you have some extra sauce left, bring it to the table for an extra drizzle.Enjoy! So much Zucchini so little time!